The SeaLife Photo Pro Backpack’s exterior is made of durable ballistic nylon with retention straps that wrap around the backpack, which, in the event the zippered pockets are not securely fastened, will prevent gear from falling out. The compartment’s waterproof liner prevents damp camera gear from leaking into the adjoining dry compartments. 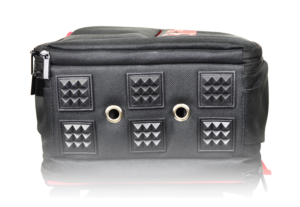 Next to the larger camera compartment, there is an accessory compartment with five zippered pockets for storing common items, like cables, spare batteries, chargers, adapters, manuals, smartphone, sunglasses, etc. In the rear is a larger soft-lined padded compartment for notebook PC’s or tablets. The external zippers are made of corrosion-proof material suitable for marine environment. Six rubber feet on the bottom of the backpack ensure it stands upright and avoid direct contact with the ground or deck surface of a boat. Two large drain holes on the bottom ensure drainage and fast drying. 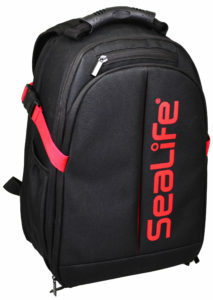 The SeaLife Photo Pro Backpack features a large padded camera/lighting compartment with six adjustable dividers to fit virtually any combination of cameras, lights, strobes, lenses and accessories. The rear of the backpack features soft, breathable padding so that it rests comfortably against the wearer’s back.